I couldn’t really think of any specific food to try and match this wine with: the vague term “picnic” came to mind, as did the words “sun”, “beach”, “girls in summer clothing”, “public drunkenness”, and “fun”. It’s a fun wine, fun to drink, easygoing, surely a popular choice for any spring or summer gathering that requires something a bit more “adult” than soda. At $9.99, it’s ALMOST the same price as soda (you know… gourmet sodas). The wine closest to vinho verde in my mind is txakolina, the delightful fizzy white wine from the Basque region of Spain. 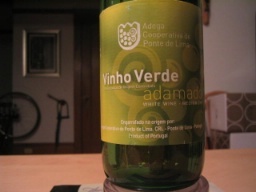 The vinho verde from Adega Cooperativa de Ponte de Lima, however, is sweeter and juicier–the txakolina I’ve had is leaner, drier, and has a bit more of a mineral edge. Some interesting information about vinho verde: it literally means “green wine” and is meant to be consumed very young–so soon, in fact, that most producers don’t even bother with vintage dates. I had considered vinho verde to be exclusively a white wine, but in fact a large percentage of vinho verde produced and consumed in Portugal is red. Your homework assignment: buy a bottle of vinho verde and drink it up! Extra credit–find a bottle of RED vinho verde and let me know what you think! Great post! I thought I recognized this picture! That’s my house!